Hi, I’ve been using Oceanix for quite awhile on my site. I have the paid developer version and had it set up by a freelance web artist. I then had another freelancer add a bunch of additional content. Now I’m managing the page myself and I’m not sure how to add google adwords/adsense. How do you access help and support for those settings? Hai. Just go to dashboard > appearance > theme options > google adsense settings. You can copy and paste your adsense code inside each of the settings accordingly. I’m having some issues with this theme and how it is displaying images after I create a new post. What happens is, the featured images show up on the homepage, so you can see those along with the text and “Read More” buttons. But when you click on a post to read, taking you to the article itself, you do not see the image…which is supposed to be at the top of the article. Is there is reason for this happening? Has anyone had problems with this and had this resolved? hi vaderboo, do you mean the ‘featured image’? they only appeared in homepage aside article. if you want them to appeared in single post add this to single.php loop. maybe above the h1 title or below. I appreciate your feedback, though I am encountering some interesting issues. Your solution does indeed work but something very funny happened: Every time when I try to make updates in the base css (and other css related pages) it reverts back to the same css that was there before as if I didn’t apply any changes to it. Is this a bug issue? do you have wp-super-cache plugin installed? try checked the no-cache for url with parameter ?= in the end. I’m not sure what you mean by your second sentence, if it’s pertaining to whether I have that wp-super-cache plugin or not. Is there a way I can overwrite this within the theme itself? yes, do you have installed plugin like wp-super-cache or any cache plugin?. the only reason the edits you made still the same, might be cache issues. 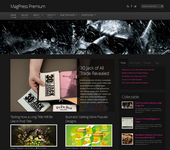 Very nice and cute wordpress theme. I will use it for my personal blog. I like responsive wordpress site style. Thanks for the share! Hey, I was using the Oceanix free theme and purchased the Develop License. I have a question regarding the difference between the files in each one. Are the css files the same exact files that are in the Oceanix free version the same as in the Premium? Reason being I am finding out that all the work I did in the free version I have to do over again with the premium purchase. Can I just copy and paste over the files to save me work, that is … presuming the files are the same for the css? hi maccoy, you just need to replace lib/functions/theme-functions.php (dev version) to the free version and you can remove the sidebar.php link codes or just replced the sidebar.php (dev version) to the free one. Is there a way to add arrows to the sliders? Any suggestions for code? wow..you guys really had tons of great free themes. one of the best theme directory. html5/css and respond design surely a plus:) kudos! !